An unusual composite from 3 different telescopes. RGB Color from ST10XME on 12.5" RC in my backyard, Sacramento, CA. and from the 16" RC at 3GT in New Mexico Skies. 2 hrs Luminance taken on 3GT, 16" RCOS RC and STL11000XM at New Mexico Skies. 45 min Lum from Ken Crawford using Yankee Robotics Trifid 6303E and 20" RCOS RC in Camino, CA. The galaxy in the lower right with surrounded by the 3 stars in the line of sight is mag 13.7 PGC56636. This image from the above article is from the second generation Digital Sky Survey (red plate) and represents 5′ on a side. It shows the designations for 5 galaxies, a-e, and the tidal tail. These objects are included as a Hickson Compact Group (HCG). The interest in these objects is directed toward understanding if dwarf galaxies form during tidal interactions among giant galaxies. Seyfert’s Sextet appears to lack young star clusters or tidal dwarf galaxies. These galaxies are most early type S0/E. One of the interesting aspects of Seyfert’s Sextet according to the article is that the tidal interactions have not led to new star or star-cluster formation. Analysis of the point sources suggest an age >1Gyr. A natural color imaged from the Hubble Space Telescope is shown below and is oriented to match that of my image above. My object "d" is blue and there is a "hint" of a spiral in my object "e". I don’t have the resolution to see the dust lane in object "a". The wispy tail above "c" in my image was not described in the article. The image below is also discussed in the article. It was taken with the 0.9 m telescope at Kitt Peak using the R-band. It shows 33 faint, background galaxies, mostly above the Seyfert Sextet toward the NW. The image was rotated to match the orientation in my image. 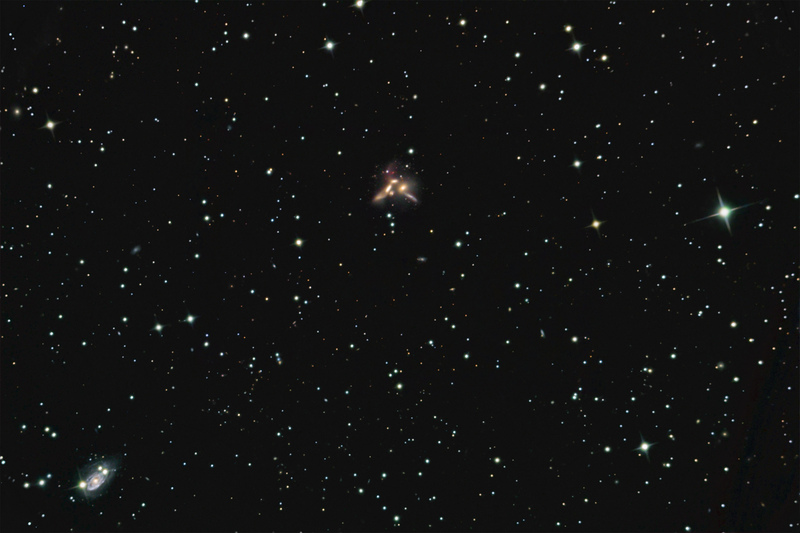 Below is a blowup of my image with the above background galaxies annotated. I don’t know what magnitude these are, but I was surprised that most show up in a 16" telescope with only about 5 hours of exposure time.